If 450 horsepower's not enough for your F-150 Raptor, Hennessey has you covered. 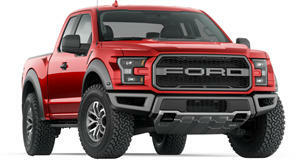 For most people, the standard Ford F-150 Raptor has more power than you’ll ever need for a pickup. Texas tuning company Hennessey Performance Engineering flatly disagrees, however, and is offering a new VelociRaptor upgrade package which cranks up the power considerably. Based on the current Raptor’s 3.5-liter V6, which produces 405 horsepower and 510 lb-ft of torque, Hennessey’s VelociRaptor will turn your F-150 into a 605 horsepower monster with 622 lb-ft of torque. With this upgrade installed, the VelociRaptor will sprint from 0-60 mph in 4.2 seconds, beating the standard raptor by 0.8 seconds. Should you opt for this package, Hennessey will install a high-flow air induction system, Stage 1 Twin Turbo upgrade, a bigger intercooler and a remapped ECU to get the most out of the new components, as well as a new stainless steel dual exhaust. The 605-hp VelociRaptor upgrade costs $22,500 – but that isn’t even the fastest package. For $49,500, Hennessey will fit a stage 2 turbo kit, stainless steel turbo manifolds and wastegates, better intercooling, twin blow-off valves and further tweaks to the ECU. The result? You’ll be the proud owner of a brutally powerful Hennessey VelociRaptor pickup with 700 horsepower. Hennessey is also offering two off-road packages for the VelociRaptor. The first adds new front and rear bumpers, additional LED lights, 35-inch Toyo tires and a three-inch suspension lift for an extra $12,995. Alternatively, shell out an extra $10,000 and you’ll also get a Texas coal-roller’s eight-inch lift kit, beefier 37-inch tires and revised suspension to tackle off-road terrain. Hennessey is only planning to build 100 VelociRaptors this year however, so you may want to snap one up fast if you fancy a pickup with as much power as your average supercar.